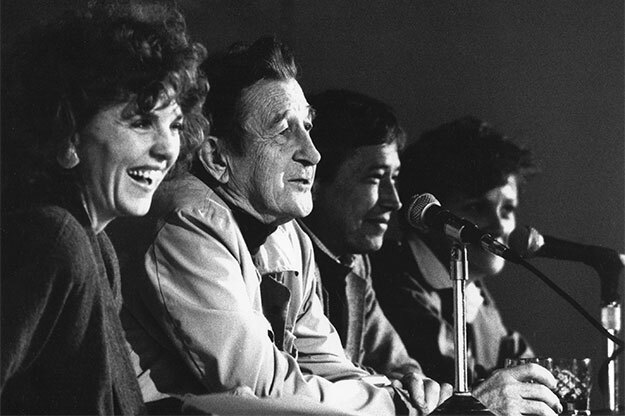 UND alumnus and literary legend Thomas McGrath (second from left) takes part in a noon-hour panel discussion during the 1985 UND Writers Conference. 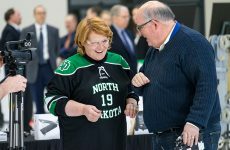 The panel was led by UND English Professor Sherrie O’Donnell (at left). 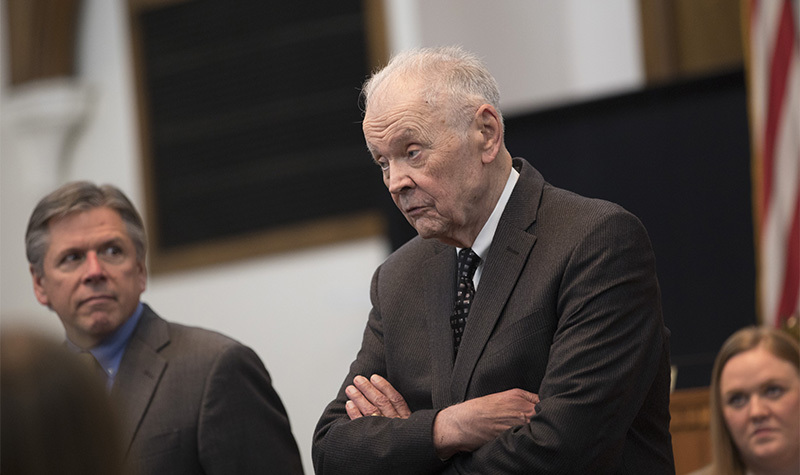 On Sunday, Nov. 20, colleagues, friends and admirers gathered to observe the 100th birthday of one of the literary giants in North Dakota history. Thomas McGrath was not there to join them — he passed away in 1990 — but his reputation continues to grow. 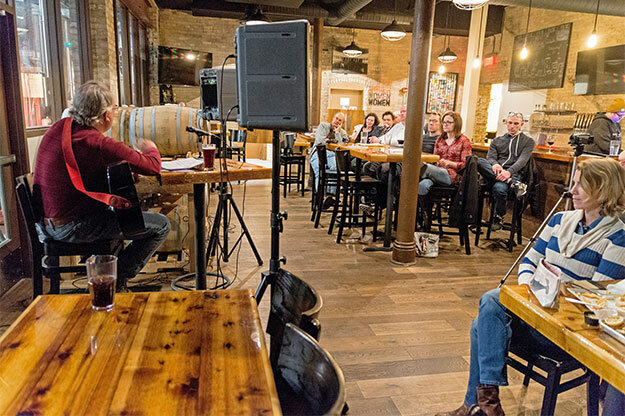 The celebration of the life and work of this renowned poet and UND graduate was organized by the North Dakota Quarterly, the UND Writers Conference and Rhombus Guys Brewing Company of Grand Forks, which hosted the event. Rick Watson, singer/songwriter/poet, North Dakota associate poet laureate and an educator at Minot State University. 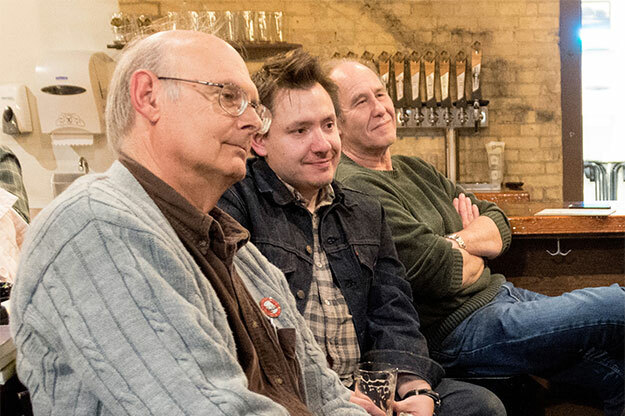 Among the audience members taking in the presentations was McGrath’s son, Tom, an engineering inspector in Long Beach, Calif.
McGrath’s son, Tom (center), listens to presentations at the centenary celebration. 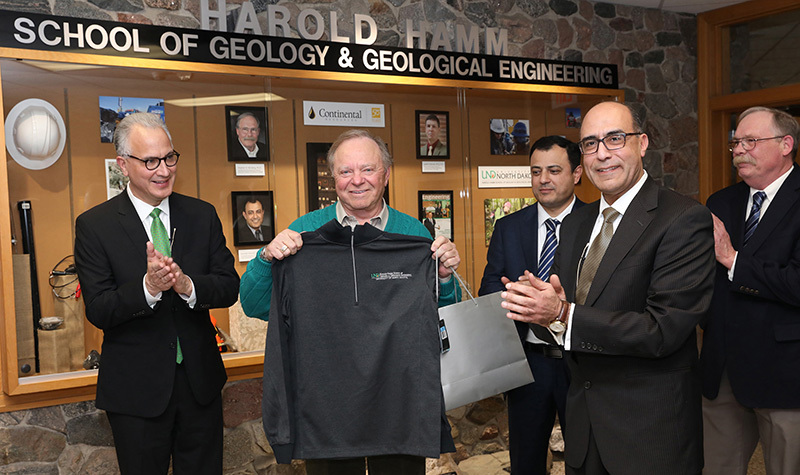 At left is Dale Jacobson, honorary poet laureate of North Dakota, and at right is Jim Mochoruk, UND Chester Fritz Distinguished Professor of History. For more than 50 years, Thomas McGrath produced a wide range of works, ranging from children’s books to film scripts, but it was his poetry that established him as a major figure in American literature. His upbringing shaped the strong leftist outlook he sustained throughout life. Raised in Sheldon, a small community about 35 miles southwest of Fargo, he saw poor farm families fight and lose to large outside interests. Like so many, his own family lost its home during the Great Depression. McGrath graduated from UND with a Bachelor of Arts in English in 1939, followed by a master’s degree from Louisiana State University in 1940. At UND, McGrath was elected to Phi Beta Kappa and wrote numerous prose works and poems, one of which was published in an anthology, Best Poems of 1937. He was selected to be the University’s 10th Rhodes Scholar, but it would be several years before he would make the trip to Oxford. Traveling, teaching and working odd jobs, he landed in New York where he worked on the waterfront as a labor organizer, editor, and briefly as a welder. During World War II, McGrath served in the Aleutian Islands with the Army Air Force. He then took up his Rhodes scholarship but left after a year over disagreements with his proposed thesis. 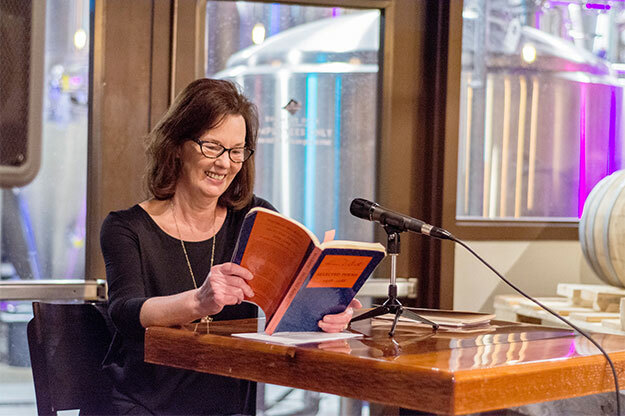 Pamela Sund, an educator, artist and writer, is the co-editor of Thomas McGrath: Start the Poetry Now!, a collection of memoirs, interviews and commentary. Wondering if the West Coast might be more amenable to his outlook, McGrath moved to California in the early 1950s and secured a teaching job at Los Angeles State College. “In 1952, the House Un-American Activities Committee (HUAC) came to the City of Angels looking for devils, particularly in the motion picture industry and in education,” wrote Gene Frumkin for a fall 1982 issue of North Dakota Quarterly. Known for his leftwing views, McGrath was subpoenaed. He refused to cooperate and was subsequently fired from the college and effectively blacklisted. He left California and taught at C.W. Post College (now C.W. Post Campus of Long Island University) before returning home to teach freshman English at NDSU in 1962. For McGrath, the California experience laid the groundwork for his best-known work, Letter to an Imaginary Friend. A sprawling poem both personal and political, McGrath wrote and published it in sections between 1957 and 1985. A definitive edition (400 pages long), published in 1997 by Copper Canyon Press, compiled all four sections and drew on the author’s previously unavailable drafts and notes. Singer, songwriter and Minot State University educator Rick Watson performs for the participants at the McGrath centenary celebration. On May 10, 1981, UND conferred an honorary Doctor of Letters degree on McGrath during the spring commencement ceremony. He had also been honored as a Guggenheim Fellow, and twice as a National Endowment for the Arts Fellow and Bush Fellow. He died on September 20, 1990, at the age of 73. His output includes 30 books of poems, two novels, books for children, and some 20 scripts for feature and documentary films. 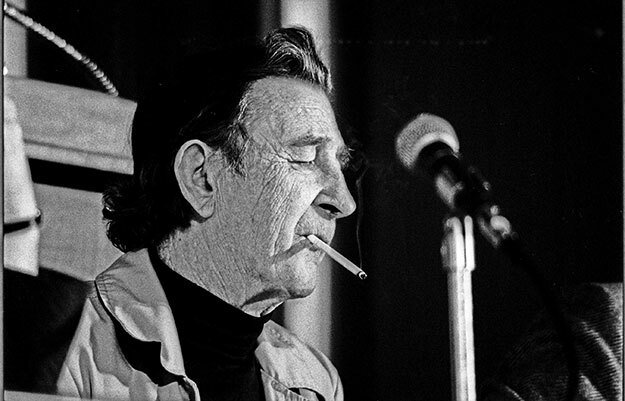 McGrath lights up a cigarette during a panel discussion for the 1985 UND Writers Conference. Over a half century, UND alumnus, McGrath, produced a wide range of works, ranging from children’s books to film scripts, but it was his poetry that established him as a major figure in American literature.